The best stickers for high-quantity orders. Custom roll stickers and roll labels have some real advantages over their full color or screen printed counterparts. Even when paying per color, they can beat out full color sticker pricing at higher quantities. Roll stickers have the most stock options, including paper and foil stickers. 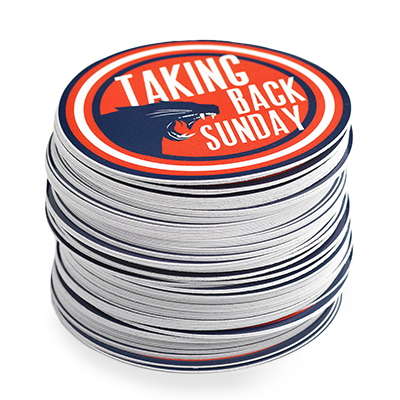 Plus, you'll never find an easier way to transport and distribute your stickers than when they're on a roll. Note: We've avoided all puns about "being on a roll" for everyone's benefit. -- Please Select --0.5" x 0.5" 0.75" x 0.75" 1" x 0.5" 1" x 1" 1.5" x 0.5" 1.5" x 1" 1.5" x 1.5" 1.75" x 0.75" 2" x 0.5" 2"x1" 2" x 1.25" 2" x 2" 2.5" x 1" 2.5" x 1.5" 2.5" x 2.5" 3" x 1" 3" x 3" 3.5" x 3.5" 4" x 1" 4" x 1.5" 4" x 2" 4" x 4" 5" x 1" 5" x 3" 5" x 4" 6" x 2" 6" x 4"
Individual Sheeting - Pre-cut, individual stickers. We'll contact you to coordinate your barcode data. We'll contact you to coordinate your individual sheeting. Personalize your screen printed stickers with print upgrades. How durable are these stickers? That depends on the stock. Check out our sticker durability blog post for more info. How do I setup a custom shape? Check out our in-depth die line blog post. Can I order a custom size? Of course! Request a custom quote for pricing. Do you sell machinable labels? All of our roll stickers are machinable. Request a custom quote so that we can coordinate the your machine specs with you.